Boeing’s new robot riveters help ramp up production of 737s from 42 a month to 47 and eventually 52 a month by 2018. It?s called the Panel Assembly Line, or just PAL. Seeing it set to the task of riveting the wing assemblies on the Boeing 737, it might better be called Speedy. With its test period over, PAL now sits on the Boeing (NYSE:BA) assembly line in Renton, WA drilling holes and installing rivets in the wings of 737s, and in the process, cutting the production flow by 33 percent while eliminating defects by 66 percent and cutting worker injuries by 50 percent. Installation of the robot riveting systems on both of Renton?s assembly lines will enable Boeing to ramp up production of the jet liners from making 42 a month to 47 and eventually 52 a month by 2018, which far outpaces rival Airbus production of its A320s. Renton puts out two-thirds of the planes Boeing makes and PAL will help enable the company to boost production. This summer (2015) it will open a third line that will start building the newest version of the plane, the 737 MAX (fuel-saving version of the 737). By New Year 2015, the “737 had an order backlog of 4300 aircraft, including more than 2,600 orders for the 737 MAX. This is about one-third of the entire order backlog for all large commercial jets built by Boeing and Airbus. At over 13,000 sold, that’s the most of any model by any major commercial manufacturer in history. On Renton?s assembly line sits the 60-ton robot behemoth that travels along on rails doing all the riveting on a wing panel called a jig. The robot assembler drills holes into the metal wing panels and then installs the rivets into the holes on the metal wing panel. The giant robot systems are made by engineering firm ElectroImpact in nearby Mukilteo, WA. ElectroImpact is known for building the machines that build flying machines. It?s customers include Airbus, Bombardier, Embraer, and even China?s Comac airline. The robots in the Renton plant are also a sign of good things for ElectroImpact as well, because they are a milestone in the company?s engineering innovation. ?Robots applied in aerospace assembly have largely been limited in scope by deficiencies in positional accuracy. 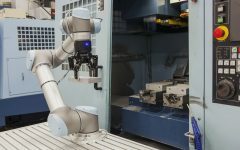 ?The majority of aerospace applications require tolerances of +/-0.25mm or less which have historically been beyond reach of the conventional off-the-shelf robot. The recent development of ElectroImpact’s Accurate Robot Technology represents a paradigm shift for the use of articulated robotics in airframe assembly.? Five of Electroimpact machines have been installed since last summer. Boeing will install eight in total, with a ninth as a spare. They replace older machines made by Gemcor, based in West Seneca, New York. ?When the third line is running, Boeing could theoretically produce 63 of the single-aisle planes a month, 21 from each line,? reports Reuters. ?Industry sources have said Boeing is gauging the ability of suppliers to handle 58 planes a month. Boeing declined to comment on any plans beyond its announced target of 52.? Boeing retained the title of the world?s largest plane maker for the third year running, delivering 723 jets in 2014. Airbus handed over 629, three more than in 2013.